Almost a decade ago, budding Japanese developer Daisuke Amaya (aka Pixel) first set to work on creating a platform adventure game about a young cyborg boy who wakes up with amnesia in a vibrant subterranean world populated by charming, rabbit-like creatures. As he toiled away over the course of five years to complete his first gaming project, he never expected it would grow to become one of the most renowned and revered freeware indie PC games in Japan and abroad. With work on updating Cave Story for its WiiWare debut now in the home stretch, Pixel and the small U.S. development team at Nicalis are anxious to introduce scores of new players to the indie classic. 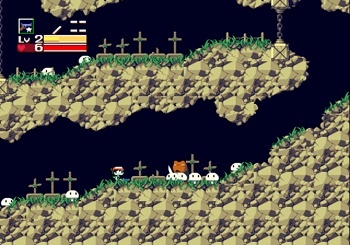 The original Cave Story was first released in 2004 in Japan as Doukutsu Monogatari. Players immediately picked up on its melancholic story and endearing characters. Pixel received positive feedback from friends during development of the game, and he put as much of his energy and passion into the artwork, music, and design as possible. He initially hoped people would enjoy his creation, but their overwhelmingly positive reaction far exceeded any of his expectations. "The number of fan-mods based on Cave Story was very impressive, and I would have never expected it," he says. "Later, the game was translated to English and even made it to other foreign countries, all of which was beyond what I would have ever imagined." Fatefully, the English translation version of the game also found its way to the computer of Tyrone Rodriguez, who went on to form Nicalis, a small independent game development studio based-in Southern California. Rodriguez became immersed in Cave Story and fell in love with it. "There was something about the game that I hadn't felt in a very long time," he recalls; it made him feel like a kid playing NES again. His experiences in the game's gripping world inspired him to contact Pixel. "I felt compelled to reach out to him and do something with the game; I really wanted to have more people play the game and experience it just like I did," says Rodriguez. They e-mailed back and forth for months, eventually deciding to work together to bring the game to WiiWare. Development of the downloadable console version of Cave Story began last summer. "We've been happy with the progress, although it has taken, I think, more time than people expected to wrap everything up. We're mainly concerned with nailing the game as best we can, and that's why we're not cutting any corners and trying to get it right," said Rodriguez, noting his team is extremely enthusiastic about the project. "There is definitely an expectation that we're trying to meet, but we all really love working on this project. It's not often that you're given the chance to work with something you feel so close to." While the core of the game itself is being left untouched, the bulk of the work on transitioning Cave Story to WiiWare has focused on updating the graphics and audio. Despite being halfway around the world, Pixel has had a very hands-on role in the updating process, providing input at every step of the way; he's as much a part of the team as anyone else working on the project, says Rodriguez. Pixel redid all of the old characters and provided editing for all new artwork in the game. This has been a substantial task, considering the original resolution is only half the size of the Wii version. "I'd like the simplistic art style and audio from the original PC game, but I'm happy with how all the double-sized art has turned out," notes Pixel. "The WiiWare artwork looks more natural."